1. Ajatasatru (अजातशत्रु, ruled c. 492 BC – c. 460 BC) was a king of the Magadha empire in north India. 2. He was the son of King Bimbisara, the great monarch of Magadha. 3. He was contemporary to Mahavira and Buddha. 4. He took over the kingdom of Magadha from his father forcefully by imprisoning him. 5. He fought a terrible war against the Vajjis/Lichhvis and conquered the once considered invincible democratic Vaishali Republic. 6. He followed the policy of conquest and expansion. 7. He defeated his neighbours including the king of Kosala; his brother occupied Kashi which was given to Bimbisara as dowry. This led to a war between Magadha and Kosala. 8. Ajatshatru occupied Kashi and captured the smaller kingdoms. 9. Ajatshatru's Magadha became the most powerful kingdom in Northern India and its power was felt far and wide. 10. At the age of 20 he was married to Princess Padmavati. 1. Amrapāli, was a nagarvadhu (royal courtesan) of the republic of Vaishali in ancient India around 500 BC. 2. Amrapāli grew to be a lady of extraordinary beauty, charm, and grace. Many young nobles of the republic desired her company. To avoid confrontations among her suitors, she was accorded the status of state courtesan of Vaishali. 3. 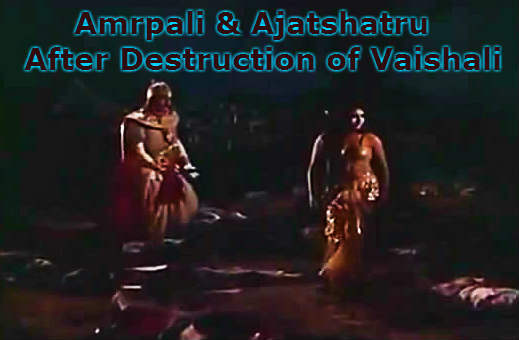 When Ajatshatru attacked Vaishali for the first time, he got injured and took refuge in Amrapāli's house. 4. Before long, Amrapāli and Ajatshatru fell in love. 5. When she learned his true identity, Amrapāli asked Ajatshatru to leave and cease his war. 6. Ajatshatru, smitten with love, did as she asked and left vaishali. 7. When the people of Vaishali, came to know that she cured and helped Ajatshatru, they imprisoned her. 8. When Ajatshatru came to know that Amrapāli was imprisoned, he attacked vaishali again, and this time he burned the whole of Vaishali. Almost everyone died in the massacre, except his Beloved Ambapali. 9. But when she saw the condition of her motherland, she renounced her love to him. 10. She went to Buddha, and following the Buddha's teachings she became an arahant later. 1. Ajatasatru's captured his father Bimbisara, because Bimbisar wanted either of Ajatasatru's other brothers Halla and the Vihallakumaras from a different mother to become kings. 2. Listening about Bimbisara's capture, Halla and the Vihallakumaras escaped to their maternal grandfather Chetaka who was the king of the Vaisali republic. 3. Ajatasatru sent notice thrice to Chetaka to surrender them but was denied by Chetaka. 4. This was enough for Ajatasatru. He called his half brothers, Kalakumaras (10 kalakumaras, those born to King Bimbisara and 10 Kali Queens Kali, Sukali, Mahakali,etc.) to merge their army with his. 6. On the other hand, Chetaka invited his own allies 9 Mallas, 9 Lichhvis and 18 kings of Kasi-Kosala to fight his grandson Ajatasatru. 8. King Chetaka's arrow killed Kalakumara, commander of Ajatasatru. 9. On the consecutive nine days the rest of the nine Kalkumaras were killed by Chetaka. 10. But still Ajatasatru's army was too good for the army of Chetaka. 11. This war was named "Mahasilakantaka", because more than lakh died in this war. Lakhs of soldiers died. 12. In this war Chetaka was defeated. 13. But Chetaka and others ran away from the battle and immediately took shelter inside the city walls of Vaisali and closed the main gate. 14. Ajatshatru too got injured, and got cured at house of Amrapali. He fell in love with Amrapali, and after he came to know that Vaishali has imprisoned Amrapali, he again attacked Vaishali. 15. With the help of his chief minister Vassakara, Ajatasatru managed to split the Vajjis and also broke the chaityas inside. Ajatasatru used a scythed chariot with swinging mace and blades on both the sides and attacked the town and conquered it. 16. Ajatasatru came to the city of vaishali and routed it with his might and this was the last attack. Vaisali was conquered by Ajatasatru. 17. Ajatasatru captured but let go of his brothers later. Both Halla and Vihallakumaras got initiated as monks in the holy order of Lord Mahavira. Chetaka courted Sallekahna(fast unto death). 18. Ajatasatru not only conquered Vaisali but also Kasi-Kosala. 1. After conquering Vaisali, Kasi and Kosala (Kaushala) Ajatasatru conquered 36 republican states surrounding his kingdom and firmly established the predominance of Magadha. 2. Ajatasatru was monarch of a huge kingdom, which covered almost all of modern India's Bihar, Chandigarh, Haryana, Uttarakhand, Himachal Pradesh, Delhi, Uttar Pradesh, One fourth of north Madhya Pradesh, tip of Chhattisgarh, bit of Jarkhand, west Bengal and Nepal. 3. Ajatasatru, with the help of his two ministers Sunidha and Vassakāra, built a fort near the banks of the river Ganges to strengthen the defense of Magadha and named it Pātali Grama(village). Later it developed into a city, which soon became popular as Patliputra, now known as Patna, the capital of Bihar.